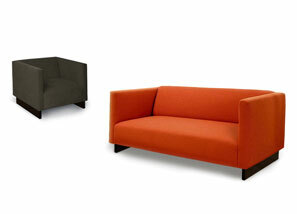 Box seating group. Clean, classic design. The beauty of the Box is the fact that such a diminutive upholstered form can be beautifully tailored, wonderfully roomy and comfortable all at the same time. It comes with hardwood "beam" legs and is available in standard chair, loveseat and sofa versions. And yes, custom sizes can be ordered.